Have a question on Amaze? Watch latest video reviews of Honda Amaze to know about its interiors, exteriors, performance, mileage and more. 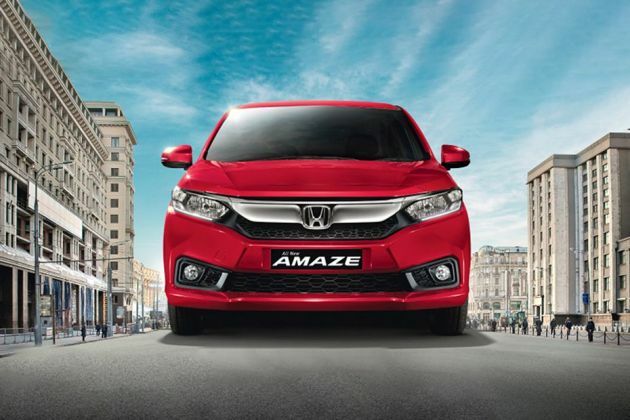 Honda introduced the first ever compact sedan, the Amaze in the year 2013 in India. The car comes under limits of a four-meter length, and the company has managed to carve out an amazingly spacious cabin and boot to make the vehicle a capable and practical package. However, since its launch, many competitors in the extremely competitive segment have come up with their updated models, creating troubles for Amaze. So, Honda responded rather quickly and revealed its all-new Amaze at the Auto Expo 2018. This time around, it has ditched the underpinnings of Brio and has been built on an all-new platform for better results. The inner and outer profile of the car has been updated while the mechanicals remain the same. Exterior profile of Amaze 2018 has been completely changed; the design is quite striking and provides the car with startling looks. The Amaze has gone bigger in every dimension and it’s quite taller, longer and wider as compared to the previous model. Wheelbase is significantly 65mm longer that benefits the cabin from inside. Most of the tweaks are seen on the front such as redesigned fog lamp enclosures, thick chrome radiator grille and revamped bumper. Amaze even gets the LED DRLs and upsized 15-inch wheels. Honda amaze features power folding ORVM with LED turn indicator and shark fin antenna. At the rear, the car has been significantly improved with c-shaped tail lamps lending it a mini-civic look. 2018 Amaze is offered in five colours they are Radiant Red, Golden Brown Metallic, Lunar Silver Metallic, Modern Steel Metallic and White Orchid Pearl. Cabin is the place where Amaze scores the highest points with new-generation features and improved gadgetry. The car offers amazing space inside the cabin while the dual tone dashboard seems quite appealing. The seats are redesigned and now offer great support and are well-contoured. The advanced floating 2.0 DIGIPAD touchscreen infotainment unit gets Apple CarPlay and Android Auto connectivity. Features that come handy are engine start/stop button, Auto AC, Multi-functional steering wheel with cruise control and keyless entry. Honda Amaze gets the same sets of engines as seen in the previous model. The petrol 1.2L i-VTEC mill can churn the power output of 89bhp and peak torque of 120Nm. Its diesel 1.5L i-DTEC engine is capable of generating power of 99bhp and maximum torque of 200Nm. Both the engines can be availed with either 5-speed manual or automatic transmission. The petrol automatic gets paddle shifters as well. Looking at the growing safety concerns and more and more automaker coming up with updated standards, Honda too came up with its own set of safety features. Amaze has been bestowed with standard safety aspects including dual Airbags, ABS with EBD, ISOFIX child seat and rear parking sensors. Honda Amaze is available in 4 different variants such as E, S, V and VX. Its base model E is priced at Rs. 5.59 lakh while the top spec variant is available at Rs. 9.0 lakh. The car stands in the most competitive segment and gives tough fight to rivals such as Maruti Suzuki Dzire, Tata Tigor, Volkswagen Ameo, Hyundai Xcent and Ford Aspire. The cabin of the previous model was really unsatisfying until the facelift version came to the fore. But this second generation model takes a leaf out of the predecessor’s design book to create its own unique elements. The dual-tone dashboard is a big jump forward with nice texture given to the plastics to make it look premium. Certain elements such as climate control knobs, steering control and buttons are beautifully finished. The cleaner looking instrument cluster with two dials and one MID in the centre will be appreciated by the new buyers. The biggest improvement can be seen in the front seats which are adorned in highly quality fabrics and gets adjustable neck restraints. The revised seats are well contoured providing excellent support. The center of attraction at the dashboard is the new Digipad infotainment system. It is smooth to operate and powered by Android Auto and Apple CarPlay. The system also have inbuilt maps which gives pretty nice user experience. Below the climate control panel, you get access to charging point as well USB inputs. The car is nothing short of offering storage spaces with large sized pocket at each door, glovebox and center armrest at the rear with two cup holders. The boot volume has been increased substantially by 20 liters which now totals to 420 liters, largest in its class. Other comfort features in the car include multi-functional steering wheel with audio and cruise control, engine start/stop button, paddle shifter, smart entry, automatic climate control and rear parking camera. Everything on the new-gen Amaze is new. The looks depending on where you are standing, resembles that of City or BR-V, and that’s a nice touch. The new model undoubtedly looks larger than the previous one, thanks to the all-new platform which has made this car grow by 5mm in length and 15mm in width. Headlamps in the car are regular halogen units while the thing that makes it look wider is the thick chrome grille bar and stretched bonnet. However, the muscular and vertical nose might split opinion. The side profile is a lot cleaner with single character line giving it a clean look. The car comes with new 15-inch alloy wheels. At the rear end, the car looks significantly distinct and more premium with solid c-shaped tail lights. The overall rear profile lends it a mini-civic look. Honda has redesigned this car from ground-up. The man maximum, machine minimum philosophy seems to have worked in favour of the company. What amazes the driver in the new Amaze is the fantastic ride quality. The new platform has allowed intense recalibration of the suspension system. As a result, the bad roads and undulation are hardly noticeable. While the suspension setup helps glide over poor surfaces with ease, on highways, it feels more poised and cocooned. The engine line-up remains the same. Honda is offering 1.2L 4-cylinder petrol engine which makes out 90PS and 110Nm of max torque. The diesel one is the 1.5L motor that pumps out 100PS and 200Nm of peak torque. Both the engines are offered in 5-speed manual and CVT transmission option. But the petrol one also gets paddle shifter with the automatic variant. The Honda has tweaked the mechanicals to remove noise and harshness in the engines. The petrol engine feels smoother and quieter now. The gusto of the diesel engine in the city is really appreciable which comes from quick response by tapping the accelerator. The brakes of the compact sedan come with a nice bite force. Further, the inclusion of ABS with EBD as standard fitment gives it more strength on the roads. Honda Amaze also gets dual airbags and ISOFIX rear child seat mounts as standard across the range. Other safety aspects in the car include engine immobilizer, rear parking sensors and impact mitigating headrests. What is the price of Honda Amaze? On road prices of Honda Amaze in New Delhi starts from ₹ 6.90 Lakh for base variant E Diesel, while the top spec variant VX CVT Petrol costs at ₹ 8.57 Lakh.